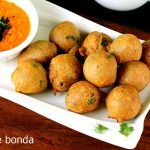 Mysore bonda recipe – Crisp fried, fluffy and light snack. Mysore bonda is one of the popular snacks served in tiffin centres in Karnataka & Andhra. Bondas are made with stuffings like potato mixture or mix vegetables. But these are plain bondas that are lightly spiced but turn out crisp with a soft, fluffy and light texture inside. 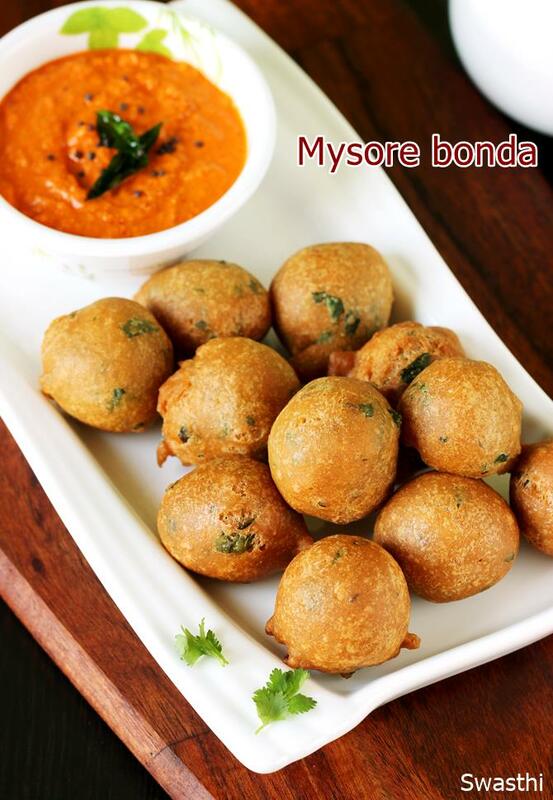 Mysore bonda is made with maida or all-purpose flour. But I have used wheat flour or atta here. The taste and texture of these is good & fluffy even when made with wheat flour. There is a nutty flavor that comes from the atta. Yogurt and soda are the ingredients that make these light. If you do not like the nutty flavour then you can make these with maida. 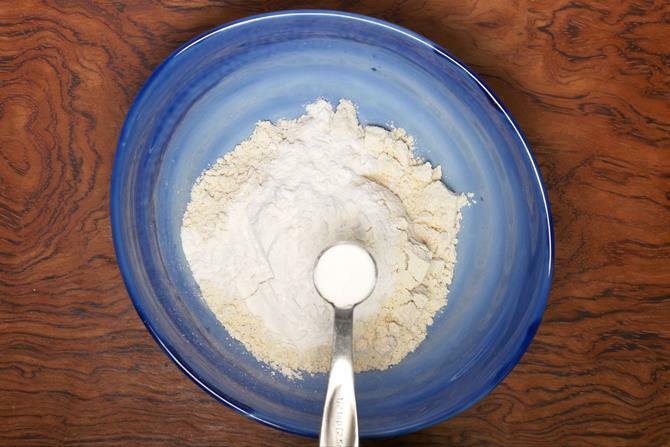 For health reasons, do choose organic all-purpose flour or at least unbleached flour. 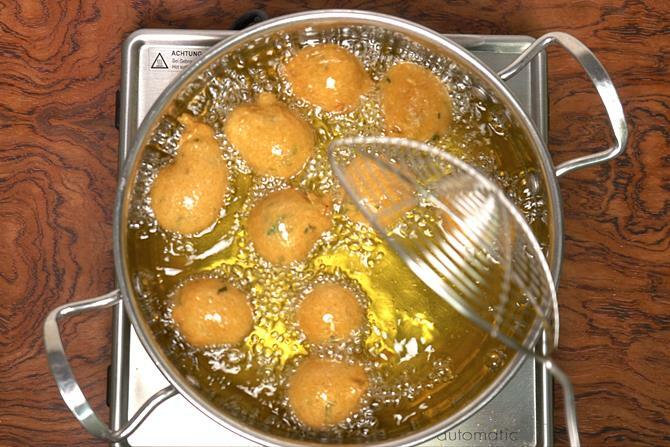 Mysore bonda is also known as goli baji or goli baje from the Mangalorean cuisine. 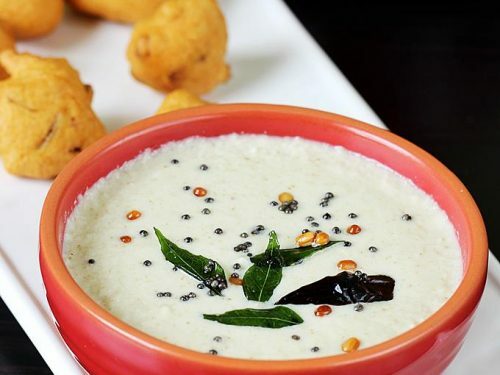 These can be served with coconut chutney. However they go well with any chutney or even with tiffin sambar. 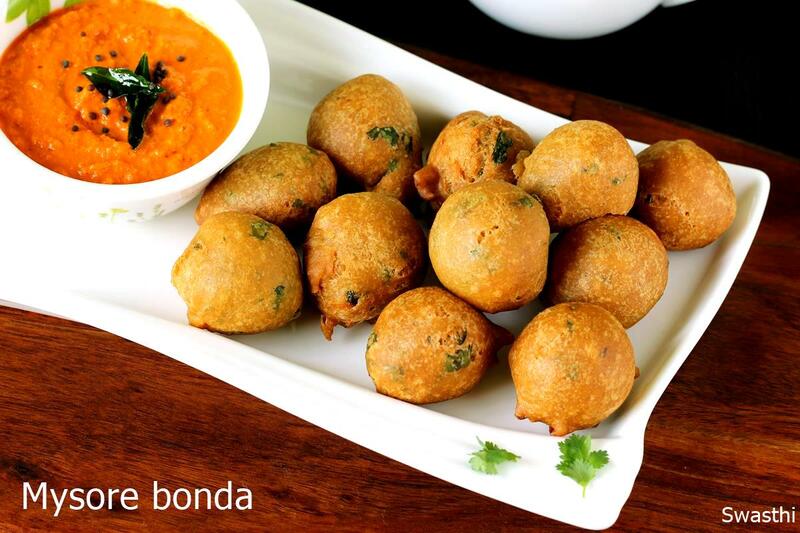 Mysore bonda are a deep fried snack food from Karnataka cuisine. 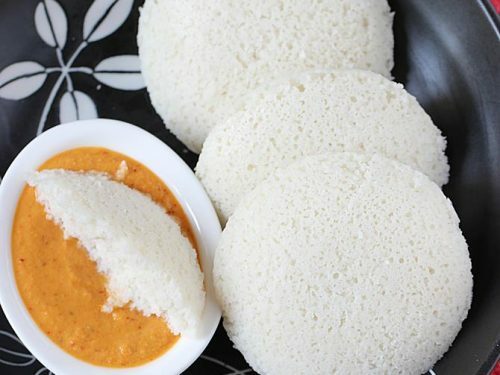 These are served with some chutney or sambar. Add chopped onions, chilies, coriander leaves and ginger. Pour curd and 3 tbsps water. 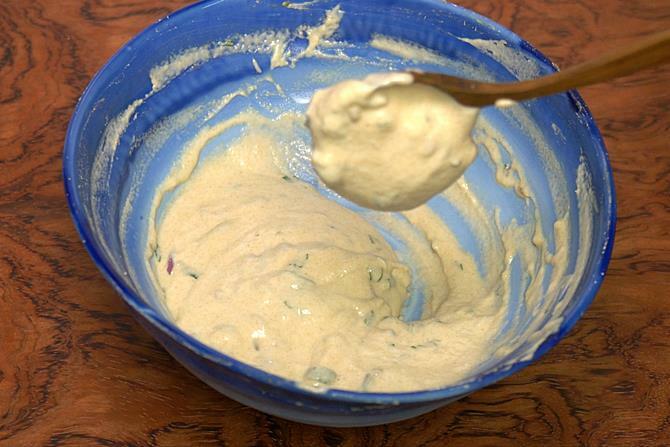 Mix well to make a thick batter of dropping consistency. The batter must not be of pouring consistency. If needed sprinkle more water or curd. 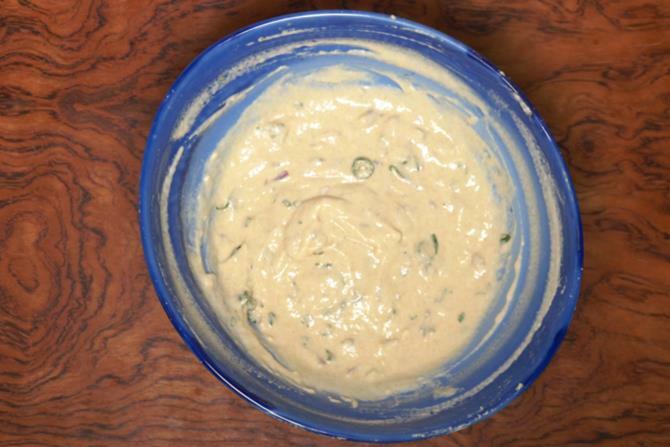 Keep the batter aside until the oil turns hot. Heat oil in a deep fry pan. 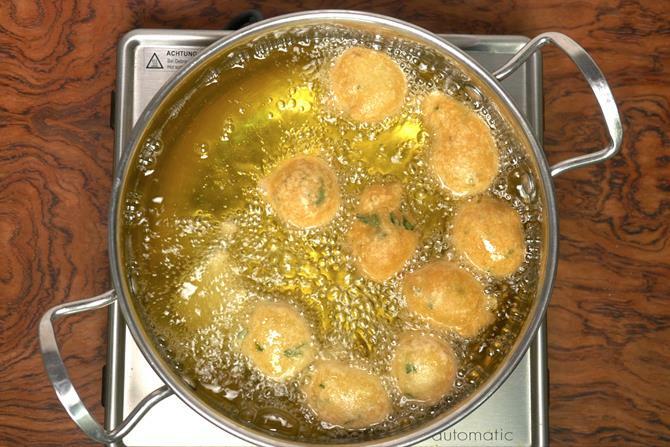 Check if the oil is hot by dropping a small portion of the batter to the oil. Batter has to rise steadily and not sink. Shape 1 tbps of batter in between your fingers. Drop them in oil. Regulate the flame to medium and keep stirring to cook evenly. These bondas usually take some time to fry well and get cooked inside. So keep stirring and fry. When they turn crisp and golden, remove them to a plate. 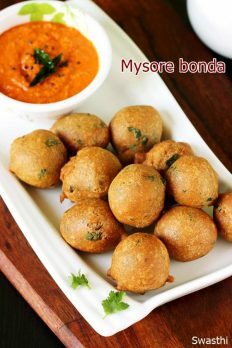 Serve mysore bonda with chutney or sambar. 1. 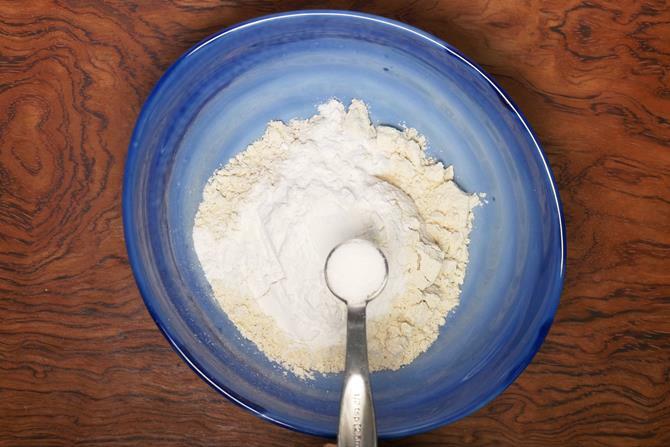 Add 1 cup flour to a mixing bowl. I have used atta, you can also use maida. Please note that the flavor of atta is prominent in these bondas. We like it so i use atta. 2. Add rice flour and soda. 3. Add salt. I added half tsp sea salt. 4. Add cumin, green chili and ginger. 5. Add finely chopped onions or coconut. 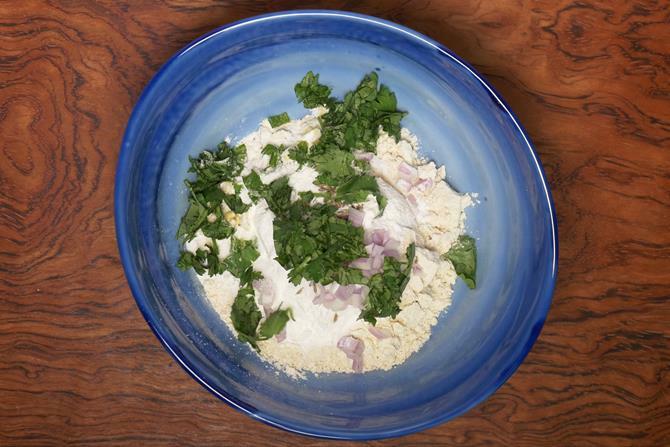 Also add chopped coriander leaves. 6. Mix them up once. Add curd. 8. 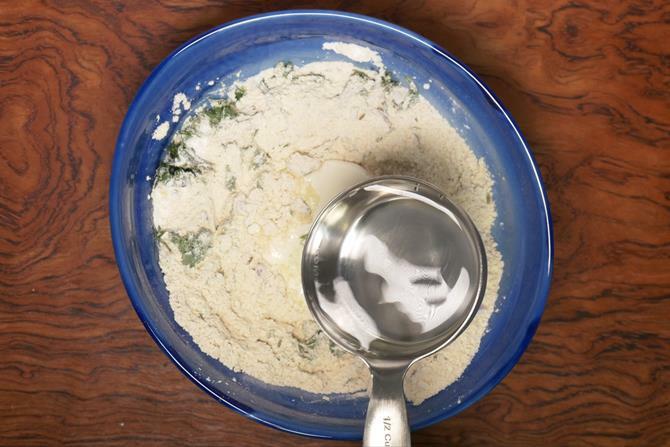 Make a thick batter. Sprinkle more water or curd if needed. 9. It must not be of pouring consistency but of drop consistency. Keep the batter aside till the oil heats up. 10. Check if the oil is hot by dropping a small portion of batter. It must steadily rise and not sink. Regulate the flame to medium high. It must not be low or too high. 11. When the oil is hot, take about 1 tbsp batter. Shape it gently and drop in hot oil. 12. They will puff up in few seconds. Keep stirring and fry on a medium flame. 13. 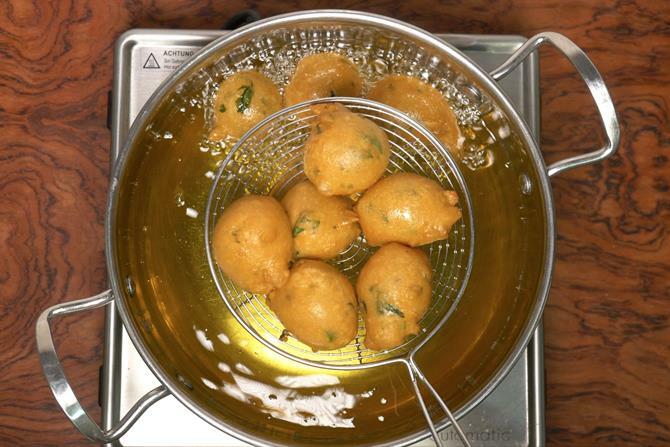 Mysore bonda takes little longer to fry than other fritters. Fry them until crisp and golden. 14. Remove them to tissue. Mysore bonda is best served hot with a chutney. .. Iam from hyderabad…. I want to know… Whether I have to leave the batter for a while before frying…. And one more thing… Rice flour is not available.. Then what is the replacement of rice flour…..
Glad to know you. You can make the mysore bonda immediately after making the batter. 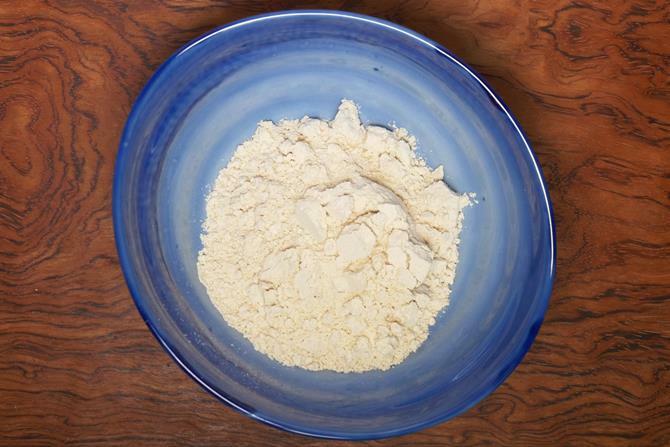 If you set the batter aside, then you should add the soda later just before frying.You can make your own rice flour by blending little rice in a small mixer jar. This flour must be fine. 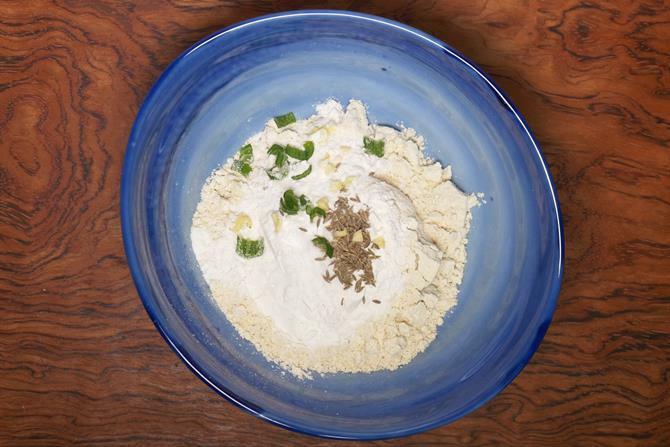 You can use corn flour or maida instead of rice flour but the texture will not be the same. Hope this helps. I tried it today and they turned out super delicious. We all liked it very much. It didn’t absorb oil at all and they were very flaky inside. Thanks for posting wonderful recipes. The best thing is your tips. They are very helpful. 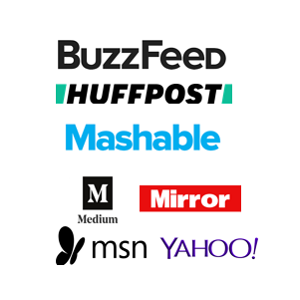 Whenever I want to cook something I am directly searching in your website. Till now I have never prepared Gutti Vankaya gravy curry. I am so used to dry version that I never thought of making it. But now I am going to try gravy version and will post you soon. Happy Dussehra to you all and have a wonderful day Swasthi! Thanks a lot for the wishes. Wish you all too a very happy Vijayadashami. Thanks for trying the recipes and sharing the outcome. Makes me really very happy. Yes do try gutti vankaya gravy. Tastes very good with rice, ghee and some vadiyalu or appadalu. Thank you so much for following the recipes. So happy to know they are useful. 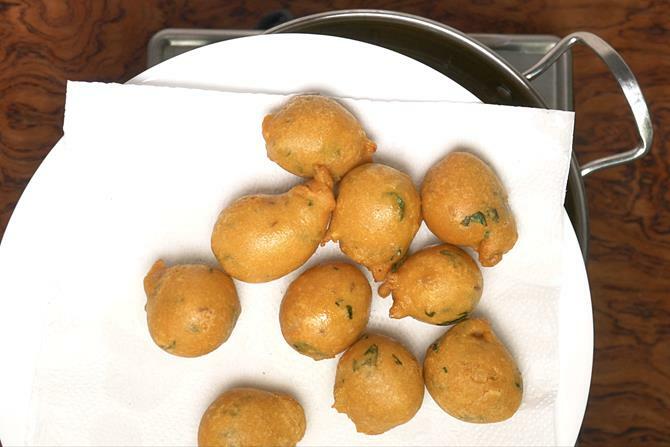 Hi, mysore bonda came out well,but oil observed more while frying, what’s my fault? 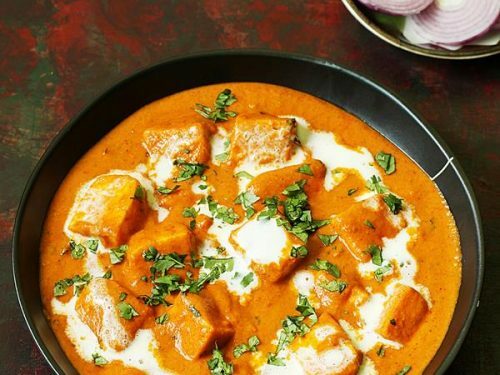 The reasons can be using cold curd, more soda or runny batter. 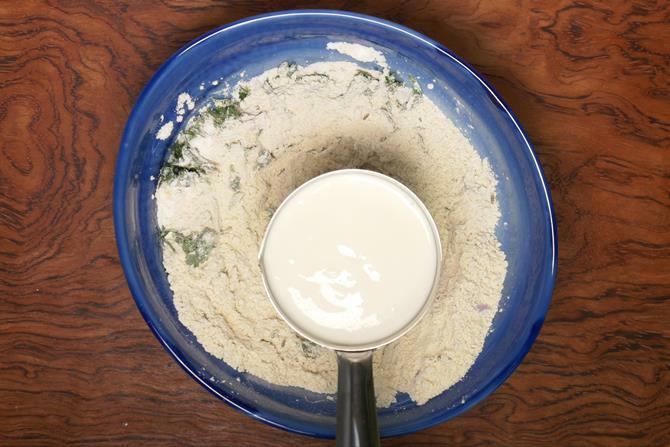 The batter must be thick like shown in the picture. 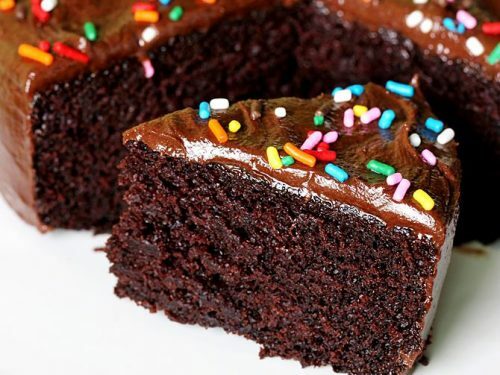 When you drop it with a spoon it must fall at one time like a lump and should not flow. I guess you may have gone wrong here. Is soda compulsory in the recipe. Yes if you dont use they may turn hard. Hi Swasthi, first of all a big thank you. 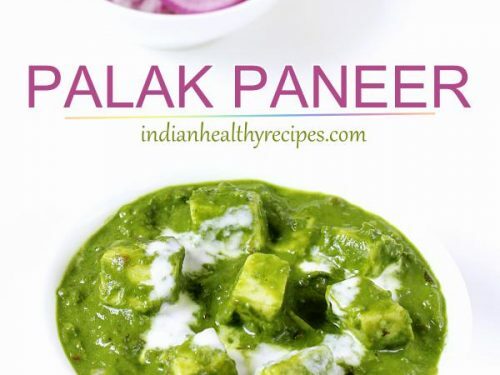 Your recipes are not only delicious but also very healthy. All of your recipes make cooking more interesting and easy. Thanks a ton for that. After checking your site there was no need for me to search any other cooking recipes. Thanks for this good work and I wish you keep doing great always with your tasty recipes. You are welcome. So glad to know the recipes are useful. Your comment made me very happy. Thanks a lot for the wishes. hi swasthi.. i was nt atall a good cook before.. bt after following bg ur recipes really my cooking has improved a lot..i m from odisha bt married a andhra guy.. so really ur recipes helped me a loooooooooooooooot to learn andhra dishes and others also. a big thank u.. Very happy to know the recipes were useful. Thanks a lot for the comment. 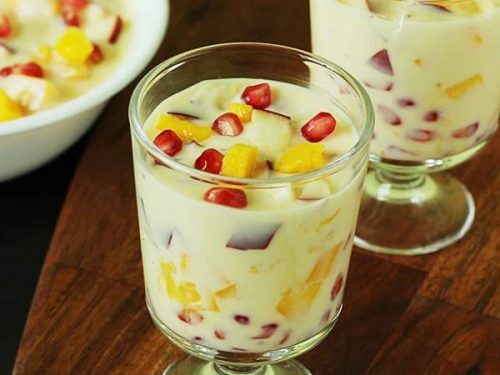 Hi Swathi, its quite some time since i am following your recepies, all of them turn out great everytime i make them, a big thumbs up from my side ?? Glad to know you. Thanks for trying the recipes and the comment too!! I made this boda today. It is very tasty. How you reuse the oil. All your recipes are very nice. Three months back searching for toddler recipes i saw this site. Then onwards there is no reqirement for me to search any site youtube for any recipe. After four years of marriage life now im cooking well.l suggested this site to my sisters& friends.toddler food chart helped me alot. Thanks swasthi. Im looking for your sweet paniyaram. Very glad to know you. I have read some of your comments earlier too. Thanks for the feedback. Regarding reusing oil, I am a bit hesitant to share this as some may humiliate me. But I do not reuse cooking oil used for deep frying. I discard the oil after every use. I do not deep fry foods often, If i do I try to use only as needed and discard it. I rarely make snacks like chakli or murukku, if I make then I make in small quantities only to prevent the oil from heating for long time. I make only as much as I show in the recipes here. To encourage healthy eating at home, I make deep fry only 2 to 4 times a month. I tawa fry papad after greasing with ghee sometimes. In a month I discard about 1 to 1.5 liters of oil used for frying, Sometimes 2 during festive season or kids’ holidays. Hope this helps.